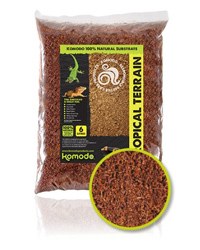 Komodo's Tropical Terrain is a natural substrate ideal for woodland or rainforest habitats. Chosen by professional breeders worldwide, it encourages natural burrowing behaving. It looks great and provides a good environment for animals that like to dig. The terrain is especially useful for creating a tropical humid set up as it holds water well.